EDIT: Are shoupies cheap knockoffs of sharpies or something else? Can you give me a link; I cant seem to find them. They're just ripoffs with a name close enough to look the same when written in cursive, but distinct enough to avoid a lawsuit. I just found them by chance in a bargain store. 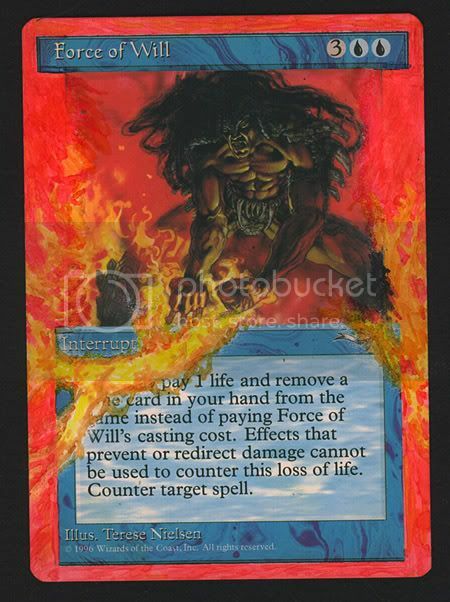 What do the magic card artists use to do their pictures? Some kind of paints or special drawing markers? 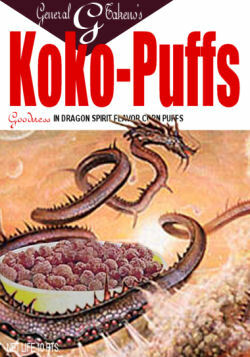 And they work better than the real thing? "I use acrylic paint, pens, markers, color pencils and alot of time!" Haven't used the real thing so I wouldn't know. Those templates would actually be very easy to do. I'll whip 'em up for ya after I get some snoozin in. Those cards were the art extends as the whole entire border look awesome,think I'm gonna go troll some sites to see if I can't pick up some. 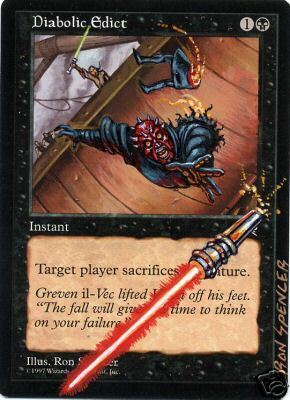 are those cards tournament legal? i would think that since the borders are colored over, they wouldn't be legal and all they would really be good for is sitting in your book and looking pretty. 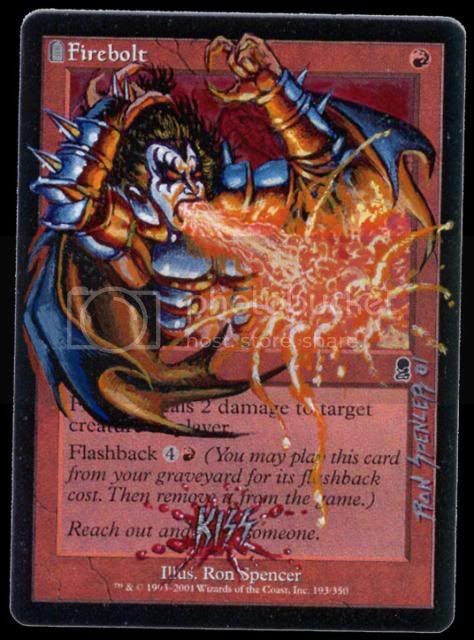 I believe that it's legal as long as the cardname, casting cost, typeline(ie the card type and the expansion symbol) card text, and p/t are visible. I'm not sure about the artist(I think the artist doesn't really matter) and the copyright line. 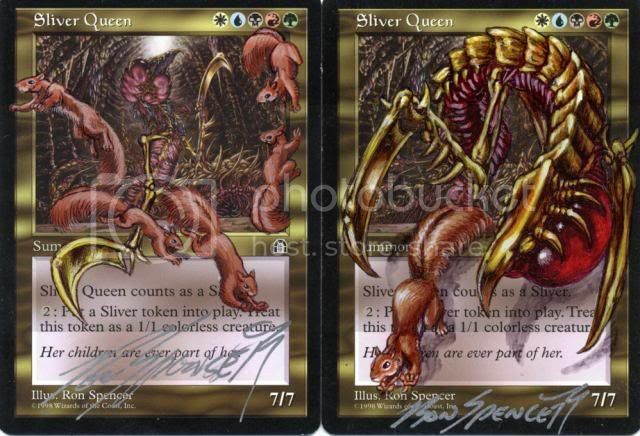 So I think the FoW PBG posted would be legal, but Ron Spencer's altered Firebolt and Sliver Queens wouldn't. well, i once played against an uktabi orangutan w/ the entire card blacked out except for the picture of the monkey's in the background, the card name, the p/t, and the casting cost. but it's black bordered, so the borders were intact. 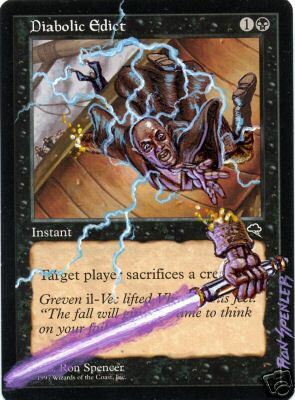 i would think that as long as you can tell what the card is, and it's a real card that's legal in that format, then it'd be legal to play w/ the alternate art. but i'm not sure. anyone here know an official ruling on it? Location: On the internets, duh. 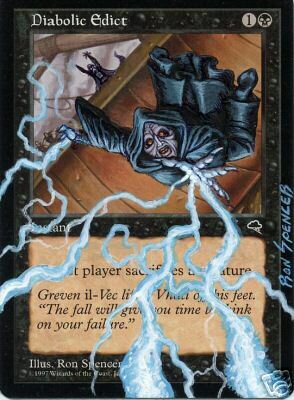 The border does not need to be visible for a card to be legal for sanctioned play. The card name (and maybe mana cost, I'm not sure) must be visible, and the art must be "easily recognizable from across the table." What constitute "easily recognizable from across the table" is up to the head judge in sanctioned tournaments. Note, however, that if in coloring the border something happened to the side of the card (which is highly likely in some cases), the card could easily be considered marked if it's not in opaque-backed sleeves. So basically, the full-art alterations are fine (and they would even be legal if you covered up the text box), and those Sliver Queens are probably legal (you'd have to ask the head judge), but some things (like the Fire Bolt, the Mana Vault, and some other things posted above) would likely not be legal. On a different note, some of those cards look awesome and I wouldn't mind having some of those full-art cards myself. I love the idea. Winner of the Weekly Signature & Avatar Contest Weeks 51, 59, 78, & 118. I don't care if I was framed for murder if I only got a warning I would let it go. EDIT: I found some acrylic paints. Should I dilute them or what? I've never done this. I'm not sure, do I just make an outline and wait for a layer to dry before painting over it? 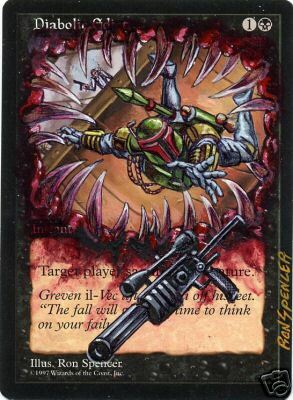 If I had a spare FoW (or spare playset) I'd do that. Or more accurately, I'd pay someone with drawing talent to do it. Do you draw on black border frames, or is it just the white ones that are doable? I've been using black bordered, and its hard for the paints to cover it up without a few coats. I havent tried WBed ones yet. I guess I will now. I'd imagine that it doesnt matter since most of the examples are blackbordered, like incinerate, fow, etc. Them's some pretty sweet alters, especially the full color borders.. just brilliant. Visit the MTGSalvation art forum for all your Magic art/artist questions, and participate in the monthly art contest!!! 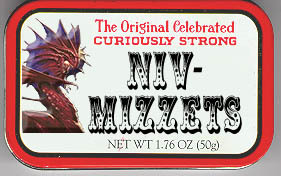 Not actually an alter, but I miss the tog's funny stuff on MTGS.. just brilliant. I've seen the Edicts before on Ron's site, but I havent seen the Muse Vessles. The one on the right is very awsome. You erase the border and maybe some frames with an eraser (or other methods, I found eraser to be the most reliable, time consuming, but reliable, not to mention cheap), and then draw on it. OH, i thought you just painted over it. I have, however, found that using an eraser to erase frames is best when I was making p9 proxies for my deck (I tried everything, and as you said, it is time consuming, but you get the best results. It also can make your hand get really tired). A better way to get blank cards is to get a cheap foil you don't want and peel the art off. Yea, but that sometimes leaves some sticky stuff left on the card. 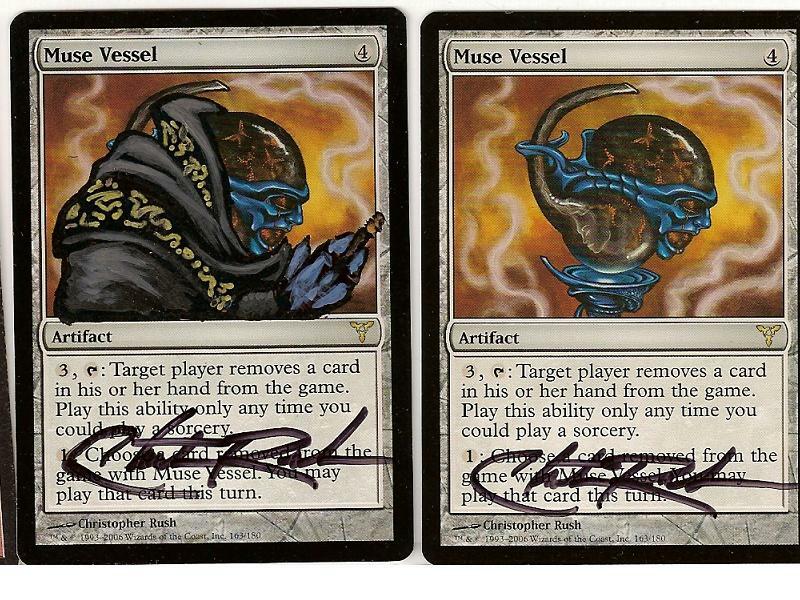 Also, marker sticks better to an erased card compared to one with the foil ripped off. If you dont feel like erasing, thats def a good way to do it.